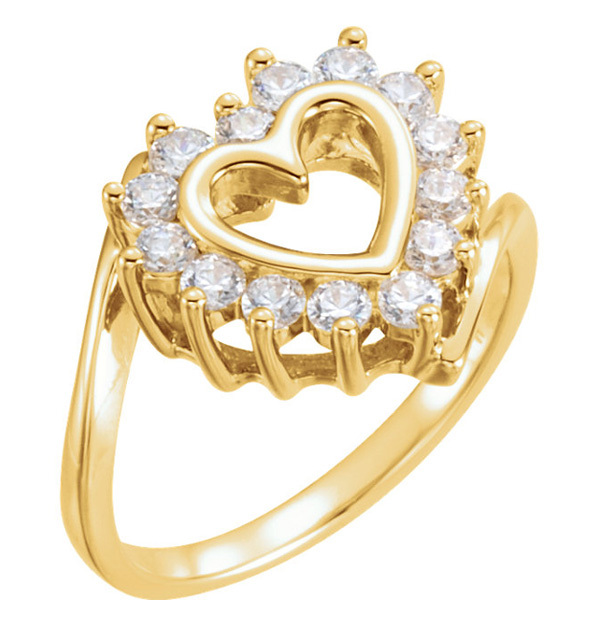 The artistic and gorgeous 0.21 carat heart-shaped diamond ring from Apples of Gold Jewelry is available in several different gold choices to allow you to choose which suits you best! This beautiful heart shaped ring, which is surrounded by diamonds, is available to you in your choice of 10K or 14K yellow gold. The heart at the center of the ring, which is a cut out design, is surrounded by a total of 0.21 carats of white diamonds. The diamonds, which are rated H Color, SI2 clarity, pop out against the warmness of the yellow gold. The band of the ring also has a unique effect, with one part of the band resting almost on top of the heart, with the other coming to rest underneath the heart. Apples of Gold Jewelry guarantees the 0.21 Carat Heart-Shaped Diamond Ring to be of high quality and an authentic engagement ring with real diamonds, as described above.